As per the variegated needs of our customers, we are providing a wide range of Ivory Brown Granites. The offered granite is processed in conformity with industry laid standards, using modern technology under the guidance of professionals. Moreover, we offer this granite in exceptional designs that can be modified in accordance with client-specific requirements. 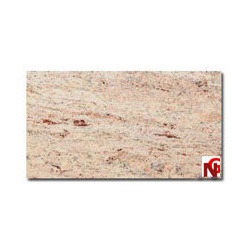 In addition, we provide the whole range of granite to our valued customers at economical price. Incepted in the year 2002 at Madurai (Tamil Nadu, India), we "Neeraj Granites" are notable Manufacturer, Supplier and Exporter of a broad range of Granite Product, Black Granites, Blue Granites, etc. We are a Sole Proprietorship firm that has developed an outstanding rapport with major stone producers around the world.The offered granites are processed by our proficient experts using superior quality stone and advanced machinery with the help of latest technology as per the set quality norms. As our offered granites are smooth-textured, cost-effective, durable, high quality, dimensionally accurate and attractively designed, they are highly demanded in the market. In order to cater to the specific requirements of our valued clients, we provided these granites in numerous specifications. We are Export our products all over the world. We are offering our products under raputed brand like NG.